Direction:You will hear four statements. Choose the statement that best describes what you see in the picture. A. 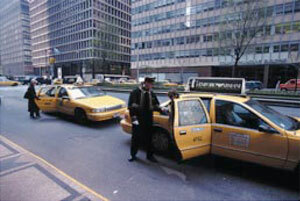 Each of the two taxis has a door open. B. The taxis have pulled right up to the sidewalk. C. Two people are getting out of the front taxi. D. Taxis may not park directly in front of the building. A. Not all the juice is sold in glass bottles. B. 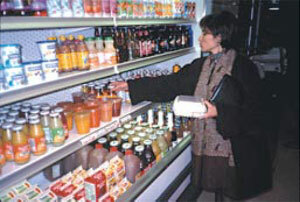 The worker is arranging the juice on the shelf. C. The woman isn't interested in buying juice. D. The store only stocks on brand of juice. Direction:You will hear a question. Choose the best response to it. Q1:How long will it take to find out who's in charge of that project? A. Not much time at all. B. I think Jack will. Q2:Would you care to see the results of the safety tasts? A. Yes, but I'm heading out right now. B. I don't care, either. C. Yes, it cartainly would. Direction:Read a question about the conversation you hear. Choose the best answer to the question. Woman A:　When I got here at 8:30 today I was the only person here! I wonder what happened to everybody this morning. Woman B:　A lot of us were here till late last night redoing the budget. I was tired, so I wanted to sleep until as late as possible this morning. Woman A:　I'm glad I had nothing to do with it. Q.Why did the woman come to work later than usual? A. She wanted to sleep as late as possible. B. There was an accident on the way to work. C. The weather was awful. D. She couldn't sleep last night because of her nightmares. Direction:Read a question about a talk you hear. Choose the best answer to the question. Thank you for calling the Hammock Supply Store's telephone information system. Our hammocks' quality is strictly controlled, and you can expect your purchase to last three to ten years, depending on the material and whether you use your hammock indoors or outdoors. Most of our hammocks come from Latin America but we also sell hammocks made here in the USA. To request a catalog, press '1' on your telephone now. To purchase one of our fine-quality hammocks now or to speak to sales representative, please hold the line. Q1: Where can this message be heard? Q2: If a person wants to talk to a salesman, what should they do? Q3: Which of these is a selling point for this company?